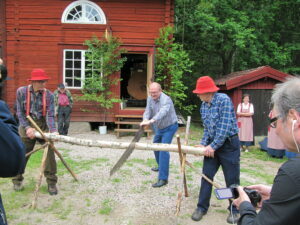 The homestead museum of Kollsberg in Torsby is located at the head of beautiful Lake Fryken. The museum gathers a large number of original wooden houses with traditional furnishings. All houses and buildings stood once in or near Torsby. From the museum grounds, you can enjoy a great view of the lake and the surrounding countryside. 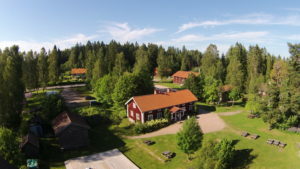 One of the buildings is a traditional Finnish smoke house. Smoke houses were built without a chimney, so that the smoke and warmth from the fireplace would stay under the roof. You can visit an 18th-century country store, where you can buy traditional goods and candy. In the old storehouse, a collection of original artefacts will tell you more about the development of Torsby from a stone age settlement to the regional centre that it is now. Learn more about the many lumberjacks from Värmland who went to work in the far west of America in the period of 1880-1930 by visiting the exposition “Skogshuggarna i Fjärran västerns skogar”. The museum café offers homebaked refreshments and local specialties. Next to the museum, you will find a public bathing area down by the lake.